A breed of cow unknown to me came to my attention a while ago; it is the Riggit Galloway. Only very recently, in early 2007, has this type of Galloway cattle been rescued from obscurity and a breeding program established under the Riggit Galloway Cattle Society in the United Kingdom. The Riggit has a long history in the British Isles, particularly Scotland. 'Riggit' has its basis in the word 'rig' which was the word for a back in old dialect, and a cow that had a white streak from tail to head was once variously referred to as a 'riggit' or 'rigget' or 'riggy' or 'rigged' animal. Certainly that is much preferable to the derogatory term of 'skunk' to which they were regularly referred when I first became involved with the British White breed. "Clifton Hawthorn with her bull calf, Clifton Firethorn"
Apparently, the Riggit marked bovine was quite common on the British Isles, which shouldn't come as a surprise to anyone really. For certain it is this very coloration that is often found in old cave paintings from prehistoric times. That fact seems to mysteriously never be deserving of comment, much less retention in a herd, when puzzling over the births of 'Riggit' marked calves for a couple of hundred years in both the polled and horned white Park Cattle of old. It is the very common purist attitude of the last hundred years and more that resulted in the relative obscurity of 'Riggit' marked cattle born in to Galloway herds until the establishment of the Riggit Galloway. Unlike the white Park Cattle of old, Galloways were Galloways were Galloways in the very early 19th century, despite the Riggit markings. This is demonstrated by the painting entitled "A Fat Galloway Heifer" dated 1804 by the artist George Gerrard, as cited at the Riggit Galloway web site. That painting is of a red 'Riggit' marked Galloway. Certain quarters of horned white Park Cattle breeders promote the notion that the 'riggit' markings occurring in the polled British White is due to outside blood introduction, and thus demonstrative of their 'impurity' as a breed. The antiquity of the 'riggit' markings in the Galloway breed quite belies that notion. Certainly, you see the line-backed or 'riggit' markings oftentimes on a cross, but they are born as well to parents who are standard white with black points for some generations back. If this were not the actual fact, then the appearance of 'riggit' marked calves in the ancient Chillingham herd, the horned White Park herds, and polled British White herds would have long since been completely eradicated as they were known to be ruthlessly culled. Further, it is only recently that the Chillingham folks have stopped claiming to be the closest bovine in existence to the ancient aurochs of Britain. Per the Riggit Galloway web site: "Interestingly, German research indicates that the pre-domestication bovines, the Auroch, may have been carrying the same markings." Certainly those markings have always seemed to me the best of both worlds, so to speak -- they have all that sun protective pigment to prevent skin cancers, yet they have the white along their back and head that provides for better heat tolerance. This young bull calf would be "baith brucket and rigget"
as he has a white line from nape to tail and his head his white. A Riggit marked cow is what most refer to as a line-backed cow these days, and in the polled British White breed there are oftentimes unexpected Riggit marked cows born to this day. More often than not, at least in my herd, those Riggit marked cows or bulls are exceptional bovine specimens. 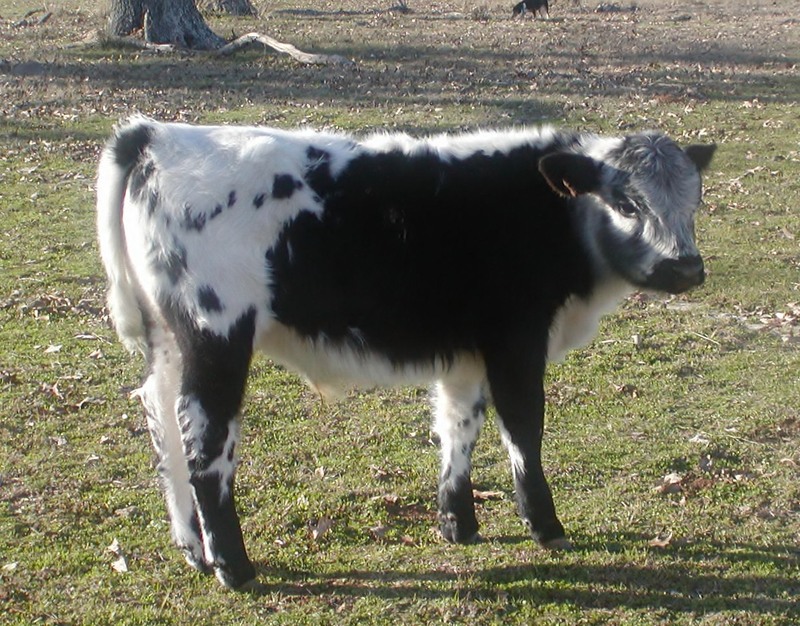 It is primarily from the Riggit marked calves born in White Galloway herds that the genetics for the recovered Riggit breed was obtained over the years. Riggit Galloways can be red or black in primary color, as is the case in Park cattle, polled or horned. Early 19th Century Scottish Fairy Tale Excerpt: "However, she employs Tom to go to a fair that was near by, and buy her another (cow); she gives him three pounds, which Tom accepts of very thankfully, and promises to buy her one as like the other as possibly he could get; then he takes a piece of chalk, and brays it as small as meal, and steeps it in a little water, and therewith rubs over the cow's face and back, which made her baith brucket and rigget. So Tom in the morning takes the cow to a public-house within a little of the fair, and left her till the fair was over, and then drives her home before him; and as soon as they came home, the cow began to rout as it used to do, which made the old woman to rejoice, thinking it was her own cow; but when she saw her white, sighed and said, "Alas! thou'll never be like the kindly brute my Black Lady, and ye rout as like her as ony ever I did hear." But says Tom to himself, "'Tis a mercy you know not what she says, or all would be wrong yet." The video below is of J.West's McQueenie, who was out of my 'Riggit' marked Bountiful 04 sired by my original 'Doc' bull, who is also the sire of J.West's W.W. Doc, J.West's Elvis, and J.West's Mazarati. Bountiful 04's dam was a quite costly Popeye daughter - HRH Bountiful, who is the senior cow in my herd today. McQueenie had standard marked 'immediate' forebears, and McQueenie has had nothing but white calves for me until her 2011 calf, and nothing but heifer calves I would add. It is this video on YouTube that led me to learn about the Riggit Galloway breed of cattle.